Petzl is coming out with two high-end unisex sport climbing harnesses in 2015, the Hirundos (a total redesign) and the Aquila (completely new). Photos below courtesy of Petzl. Comfort was considered a top priority in the design process for both harnesses. We recognize that there are multiple types of comfort: We’re not talking about the type of comfort possible on long-duration hanging belays. Instead, Petzl’s designed comfort comes from enabling a full range of motion and reducing the impact of the harness while you climb. Where the harness could contact skin, there is minimal stitching and seams are almost entirely eliminated. This reduces unwanted rubbing and odd pressure points. In addition, Petzl has debuted their FUSEFRAME technology. Read: the foam padding in the waist belt is integrated “as one” with the webbing. This is achieved as the foam is thermo-formed to create channels into which the webbing is placed. This allows for an incredibly low profile. In addition to reducing bulk, these harnesses also use dyneema for the tie-in points and the belay loop to increase durability. Dyneema has a very low coefficient of friction which allows it to slide across other materials with less abrasion than standard nylon. Both harnesses’ external fabrics are bluesign(R) certified, which is one of the most rigorous standards for ensuring textiles are environmentally friendly throughout the entire manufacturing process. Although the Hirundos was previously available, it received a complete redesign for Spring 2015. 1. Adjustable leg loops via new “HD” buckles that are smoother and more streamlined than Petzl’s other buckles. Both of these harnesses are light-weight minimalist harnesses and are not meant for extended hanging. That said, comfort was still a top priority in design, and you’ll see that in the wider padded areas and also in the placements of the stitching. The design also incorporates features that provide a more natural range of motion. 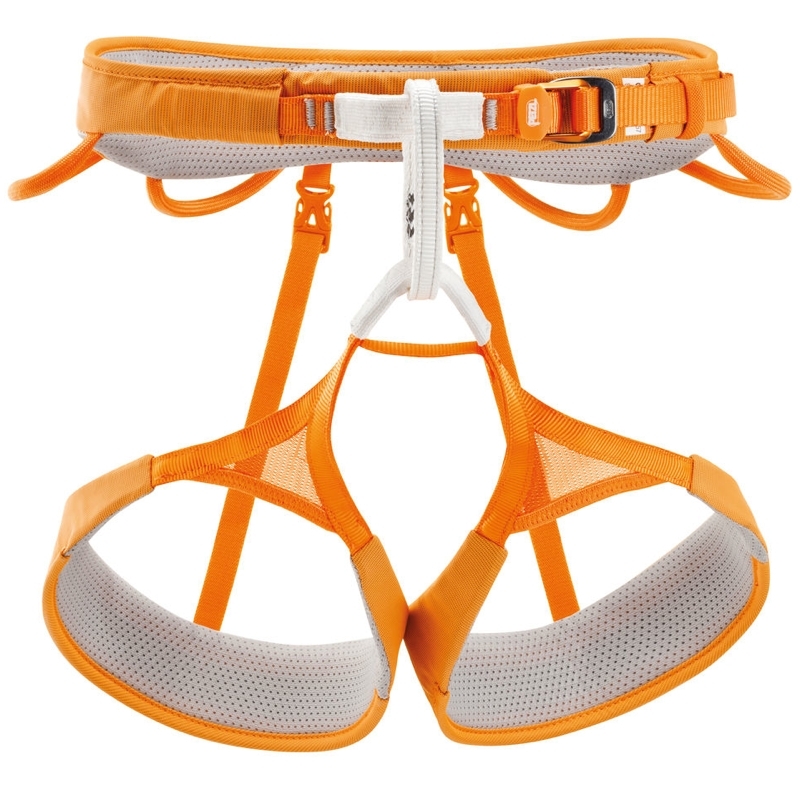 These harnesses will be best suited for sport climbing at the crag. The Hirundos and Aquila should be coming out any day now. Until then, you might even be able to find the previous Hirundos versions on sale as the retailers make room for new models.